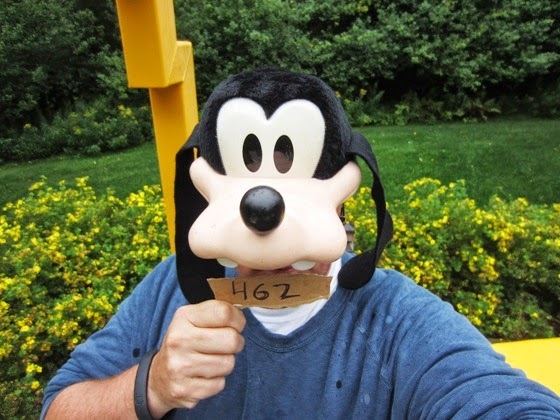 Day 462 / Hat 462: Vintage Disney Goofy hat with black, mesh, trucker-style back with adjustable closure, plush black crown, long, floppy black felt ears, beige, hard plastic muzzle, black nose pad the size and shape of a young plum, two white hard plastic teeth (canines maybe?) and a black and white plastic set of eyes on front of cap. Kindly loaned to the Project by Donna MacDonald who works with the family business (she and her husband Bill live just up the road a piece). Of it's provenance she says : "We got it when [our son] Bobby was five so that would be 19 years ago -- and we got it at Walt Disney World." I could tell the minute I got my hands on this one that it's a solid piece of vintage Disneyana. Usually when people say "They don't make 'em like they used to," they're referring to cars, bridges or buildings but in this case it's easy to see how even the souvenirs at the Happiest Place on Earth have, over the years, become something less than they once were. Of course it's really the memories minted in the Magic Kingdom that matter most -- and that's no Goofy talk. 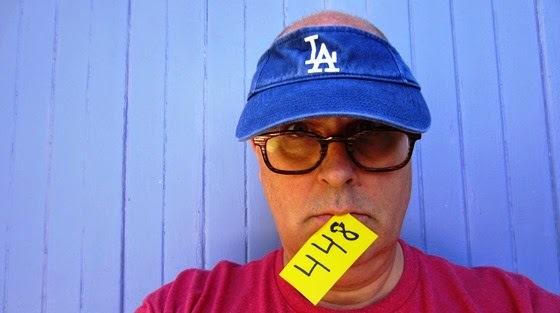 A sincere hat-tip to Donna for offering up such a delightful piece of headgear. She probably had no idea I have fond memories of cutting my own vacation canines at Walt Disney World so many years ago. Day 461 / Hat 461: Multicolored patchwork burlap hat with fringe brim and black lining. Interior tag reads: "50% hemp, 50% cotton, made in Nepal." Purchased by the Bride at the 19th Annual Southern Vermont Garlic & Herb Festival in Bennington earlier today. She purchased it -- and a couple of other handicrafts -- from a vendor at the festival called Vision of Tibet. Although there's apparently a requirement that all vendors be somehow garlic-related we spotted nary a bulb or clove in evidence during the Bride's several visits. But we're willing Tibet they've figured out some loophole. Mind the shoulder trout, that's Gilly. 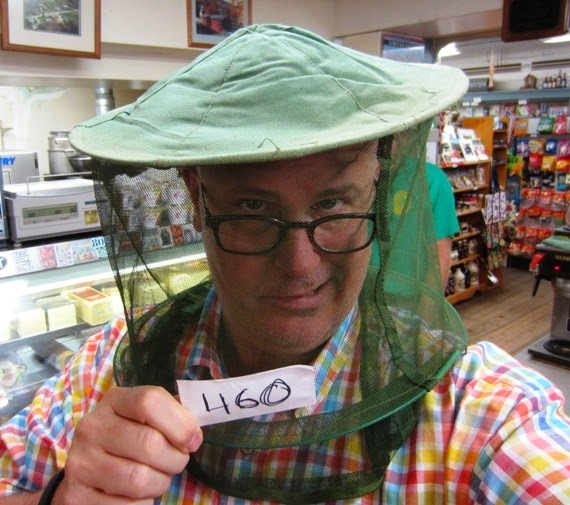 Day 460 / Hat 460: Vintage mosquito-netting hat/headgear consisting of faded green canvas top with slightly conical crown and green mosquito netting held in place by a circular rib at approximately the middle of the vertical height. Additional detail includes a cinch closure at the bottom to literally keep the buggers out. Foraged for the Project by my mother Nancy Tschorn who said it's "probably been at the Wayside Store since we bought it" (which would be at least 30 years now). On account of the simple construction, fabrication, lack of tags and considerable fading, I''m guessing it's at least 50 years old. They simply don't make things as simply any more. Down to the last 40 hats -- and they seem to be flitting by like mosquitoes past the netting! 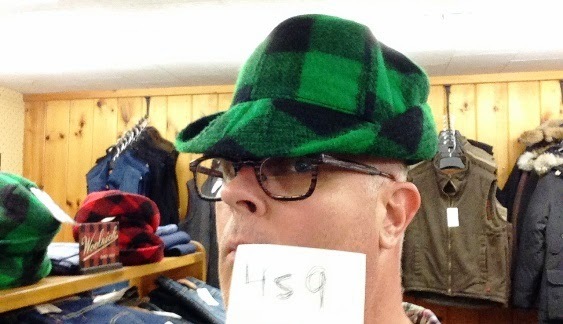 Day 459 / Hat 459: Green and black buffalo plaid bucket hat. Interior tag reads: "85% WOOL, 15% nylon, made in China, large." Hangtag reads: "10591, Jones Buffalo 481/ L / Green, $36.99." If I'm not mistaken, I may have bought some tartan formalwear business here for SVAC's Scottish Winter Ball back in 1996 - which would have marked the first official event the Bride and I attended together in our pre-wedded days. That place is jammed full of Adam-appropriate hats and I'll most likely be adding to my permanent collection from their holdings before the visit is over. Day 458 / Hat 458: Baseball-style cap of orange rip-stop Gore-Tex with "estrn mntn sprts" in tone-on-tone orange plastic. Interior tag reads: "estrn mntn sprts, Eastern Mountain Sports, made in Taiwan, one size, 100% nylon." Stealth-snapped at the Eastern Mountain Sports on Dorset Street in South Burlington -- just across the street from where I worked as a bank teller early in my post-college career. 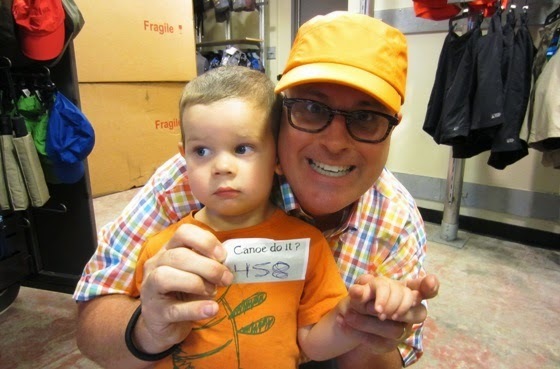 My wing moppet today was my grand nephew* Carter and we chose this particular lid so that it would coordinate with his all-orange ensemble that consisted of orange cargo shorts and orange shirt with a green "doodlebug" design. A hat-tip to l'il Carter man. May you soon speak gloriously of hats and headgear -- and whatever else the future places atop our heads. *There seems to be some discrepancy as to whether or not the son of my niece is technically my grand nephew (as referred to above) or my great nephew. At any rate he's my brother's daughter's kid. Feel free to figure it out yourself. Day 457 / Hat 457: Vintage, leopard-print velvet cone-shaped women's hat with curved edge in front and black in interior lining. Interior tag reads: "22" with the letters "MSC" in tiny type right below it. Borrowed from the KMAPLTHS (Kathleen Moore All Pine Long Term Hat Storage), this hat is part of collection of vintage lids Kathleen amassed during her childhood. She said her mom would take her around to tag sales and the like and having something to collect (the hats) gave her something to do. Although there is no other tag or identifying information in the hat, it is the same size as the first one I featured from the collection (PC 53) which was an Evelyn Varon. A cursory search of the interwebs turns up nothing pertinent though I have a hunch it might be guild or union related (it's too tiny to be a brand identifier). Let the leopard cone join the ranks of the mystery lids. A sincere hat-tip to Kathleen -- both the l'il 'Thleen of old and the modern-day version (who has contributed many a lid to the effort). Day 456 / Hat 456: Black, baseball-style cap with green and white embroidered applique patch on front tat resembles a Vermont license plate with the words: "Vermont, MPLSYRP, Green Mountain State" with a small yellow double 0 tag in the lower right-hand corner. Interior tag reads: "Otto Quality Headwear, one size fits most, 18-694, 100% cotton, made in China." The MPLSYRP is a reference to maple syrup of course, one of the Green Mountain State's most famous exports. Did you know that it takes 40 gallons of maple sap to make a gallon of maple syrup. Ayup, it does. The dapper dude joining me in today's installment is my Uncle Don (my dad's younger brother). He and his wife head to the 802 for some R&R every summer and our paths happened to cross this time around. The hat didn't belong to him (it's one of the many Vermont-themed pieces of headgear available at my family's Wayside Country Store) but he was, you might say, sweet enough to indulge me for the snapshot. Today's hat-tip goes to the folks who make Vermont's sweet liquid gold -- and the assist goes to Uncle Don. 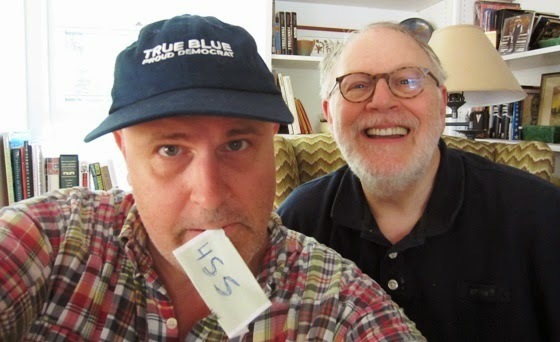 Day 455 / Hat 455: Blue, baseball-style cap with white embroidery on front that reads: "True Blue Proud Democrat," with interior label that reads "Made in U.S.A."
Loaned to the Project by my father-in-law (AKA the Admiral) who is as true blue a Democrat as they come. He's the bearded Ernest-Hemingway-looking cat in the photo with me. He hasn't been putting a razor to his face for close to four weeks now, having stepped off a curb in the Big Apple and ruptured his Achilles tendon. Frankly, I think the look suits him -- and adds to the maritime vibe of my nickname for him. Of its provenance, he says it's the result of donation to the Dems, most likely to the DSCC. Today's hat-tip? That'd be to the Admiral. He's unshaven -- I'm the Tschorn. Day 454 / Hat 454: Forest green baseball-style cap with yellow embroidery on front that reads: "HAM RADIO" vertically on either side of multi-color embroidered patch that reads: "Mount Equinox Hill Climb Manchester Vermont, VSCCA Course Marshal" with a stylized depiction of the drive up Mt. Equinox in the center. Additional detail includes yellow embroidery on back that reads "WA1DMT," and interior label that reads: "Otto Quality Headwear, one size fits most, 31-538, 100% cotton, made in China." The VSCCA is the Vintage Sports Car Club of America, and every year since I can't remember when, they've raced their vintage cars up the the five-mile private road to the summit of Mount Equinox. made that far or raising a warning if it hasn't. As a kid I used to tag along as a flag boy, standing out there with a yellow caution flag if necessary. I never got into the radio stuff the way my dad did, but you'll probably agree I doubled done on the ham part. 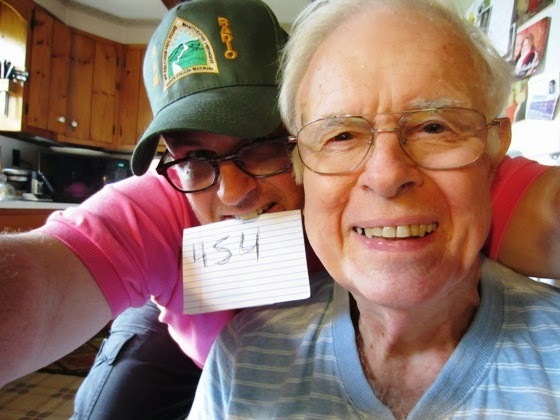 A hat tip to my dad. You don't need a radio to broadcast how awesome he is. Day 453 / Hat 453: Brown, trucker-style hat with mesh back and foam front with brown and yellow embroidered applique patch of the UPS logo. 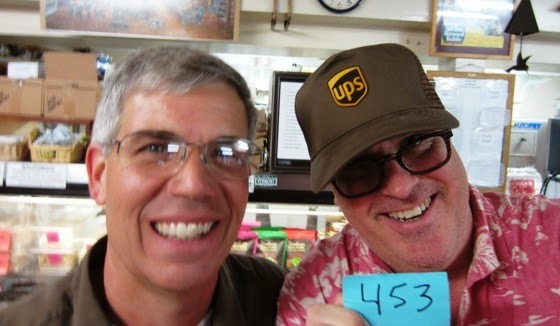 Although the hat was plucked from the DTWOH (Doug Tschorn Wall O' Hats) at the Wayside Country Store, the pluck was performed at the very same moment Bert, the UPS driver whose route includes the store, wandered in to the store. Never passing up an opportunity for a guest appearance, I asked Bert to indulge me, and he willingly obliged. Bert says he's been driving the brown around for 26 years and isn't totally sure but thinks this has been his route for "maybe 10 or 12 years." BTW, the hat didn't come to reside on the wall thanks to Bert, though we're not exactly who donated it. We think it was probably a former -- and longtime -- UPS driver we nicknamed "Parcel Pete." Today's hat-tip goes to all those who drive the big brown van of happiness -- thanks to the Bride's proclivity for the impulse purchase, we're even on a first name basis with our UPS driver back in the 323. Day 452 / Hat 452: Trucker cap with green mesh back and brim and white foam front with black screen printing on front that reads "DRUNK." Interior label reads: "Otto Collection." Photographed this afternoon in Lyndonville, Vermont, less than 40 miles from the Canadian border after taking my niece and goddaughter Alizabeth (above left) back to Lyndon State College. The hat according to Ali, belongs to a friend named Erikka who had received it - if my memory is correct - last St. Patrick's Day. 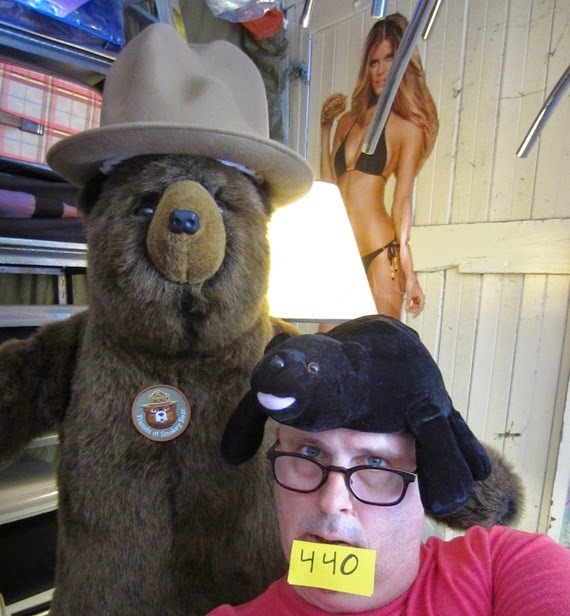 Contrary to what you may be thinking, I did not get chemically altered -- in any way, shape or form -- with the A Bear. We did, however, talk pretty much nonstop for three hours on the road which, for two Tschorns with an interest in philosophy, is a rare buzz indeed. 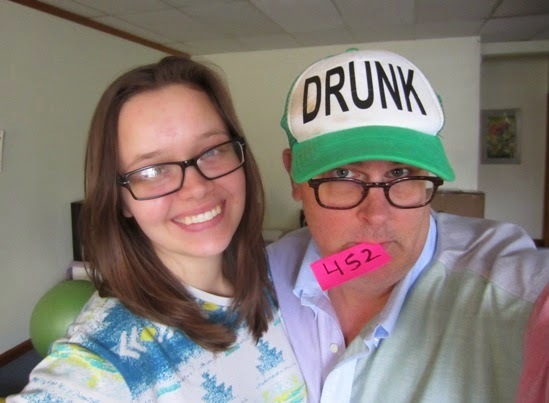 A hat-tip to my darling goddaughter. I raise my glass to you. 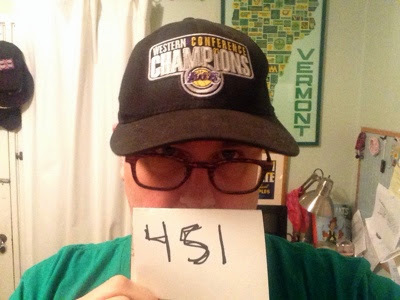 Day 451 / Hat 451: Black, baseball-style cap embroidered on the front with "Western Conference Champions" in white and gold with the Lakers logo front and center. Additional detail includes a teeny, tiny "'01" (I think) in gold on the front and a Nike swoosh (in white) on back of hat. This hat has been kicking around for, well, at least a decade and I was saving it for a Lakers moment but as the big five oh oh approaches I realize this mad run is going to end long before the first ball of the 2014-2015 season rattles in the cylinder. Day 450 / Hat 450: Khaki-colored cotton cap with embroidery on the front that reads "American Pistachio Growers" in black and pistachio green accompanied by a green, brown and white embroidered pistachio to the left. Interior tag reads: "Port & Company," and fabrication label reads: "100% cotton, made in China, RN 90836." This hat is fresh out of the box and courtesy of my Food section colleague Jenn Harris and it arrived, along with the nut in the photo with me (more on him later) some samples of pistacia vera and some press materials from the folks at the Fresno-based APG. They're touting the power of the p'stache (I just made that l'il slang up myself) as a game-day snack (because apparently nothing says football like a handful of pistachios, yo). 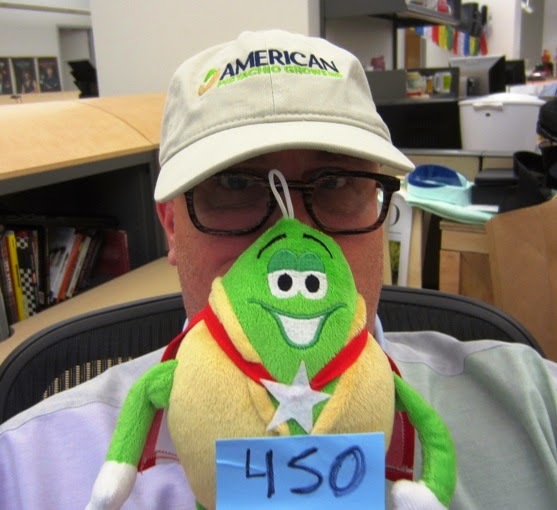 What or who are the American Pistachio Growers? According to the intel we received, it's an agricultural trade association that represents more than 600 grower members in California, Arizona and New Mexico. (That's totally nuts, I tell you!) Oh, and think of the "p" in p'stache as standing for protein, apparently the little buggers are packed with it. According to the materials sent by the APG, 49 nuts (160 calories' worth) has six grams -- and has more protein per serving than any other snack nut. OK, what the APG lacked in originality it made up for in mascot cuteness. But Jenn and I decided we'd name this one Sheldon -- and the other one that arrived in the same basket (and will spend its partially shelled existence at her desk just two cubes away) -- shall henceforth be known as Shelly. What's two more nuts in the nut bowl of this place? A hat-tip to Jenn with an assist to the p'stache people. Oh, and you know what's really nuts? 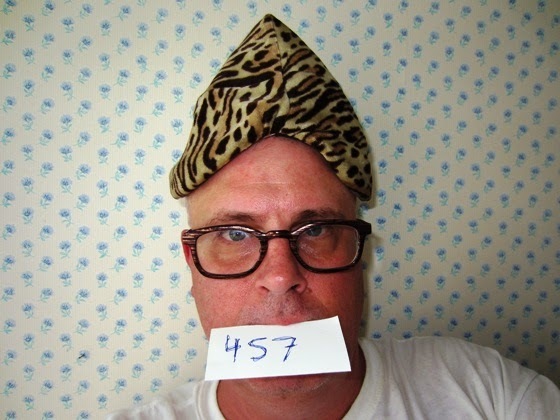 I'm 50 hats away from the big 500! 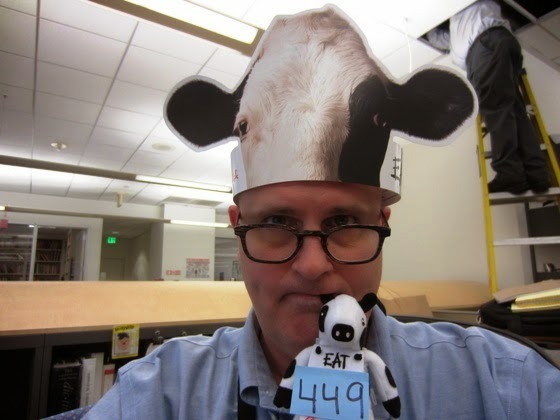 Day 449 / Hat 449: Paper headband photo-printed with the face and ears of a Holstein cow on the front. Right side printed with Chick-fil-A logo in red,left side printed with the words "Eat Mor Chikin" in black and interior printed with the following: "Come to any Chick-fil-A restaurant on July 11 wearing this headband and receive a FREE entrée. Dress completely like a cow and get a FREE meal. cowappreciationday.com #CowAppreciationDay. "'Fully dressed as a cow' means effort to be dressed like a cow from head to toe. 'Partial cow attire' means just a cow accessory, such as a cow-printed hat, vest or purse. People dressed in partial attire will be awarded an entrée vs. a full Meal." 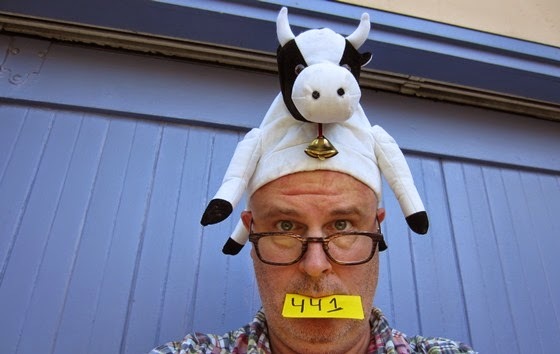 Yes, sorry to say, I'm phoning it in in this photo and barely qualifying as "partial cow." But I think I should get extra points for including a man on a ladder climbing into (or out of, we're not sure) the office ceiling in the background. Oh, in case you're wondering, even though we've missed the cow-colored boat for this year -- mark your calendar for July 10, 2015, which according to Chick-fil-A's website, is next year's big old cow day. Day 448 / Hat 448: Blue cotton twill visor with the Los Angeles Dodgers interlocking "LA" logo embroidered on front in white. Additional details include adjustable Velcro closure sizing strap in back and two interior labels one reads: "Genuine Merchandise" accompanied by the MLB logo, the other depicts a triangular pennant bearing the words: "'47 Twins" and the web address nineteen47.com. Looking back through the Project, this appears to the third piece of headgear from the folks at 47 Brand. The first was back at PC 159 where I was putting on the dog, and the second was another Dodgers hat (PC 335). 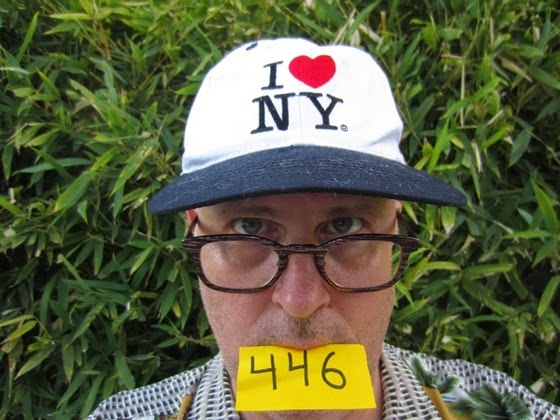 That got me wondering who exactly 47 Brand was -- and what's with the twins reference? "In 1947, twin brothers and Italian immigrants, Arthur and Henry D’Angelo founded Twins Enterprises, now ’47 Brand. The D’Angelos were entrepreneurial pioneers who were quick to see the future of sports licensing by selling pennants and other sports memorabilia on the streets around Fenway Park. Through a combination of hard work, sound instincts and incredible passion, the brothers were able to grow their business from a single street cart to a premier sports lifestyle brand that uniquely melds sport and style." According to the site, the company has licensing deals with four of the professional sports leagues in the US (NBA, MLB, NHL and NHL) and more than 650 colleges. So on behalf of those twins, I offer a hale and hearty hat-tip to all immigrants -- Italian and otherwise -- who've contributed so much to this country. 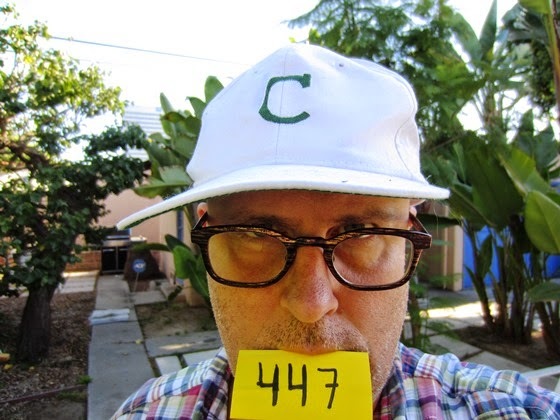 Day 447 / Hat 447: White, baseball-style cap with the letter C in green embroidery on front and the word "Chapin" in all cap green embroidery on back above plastic adjustable sizing strap. Interior tag reads: "Yupoong, 60% cotton, 40% polyester, one size fits all, made in Dominican Republic." Borrowed from the Bride, this hat references the Chapin School, the K-12 school for girls on Manhattan's Upper East Side that happens to be the Bride's (and the sister in-law's) alma mater. It's too new to be old hat so I'm guessing it was reunion-related. There's another Chapin cap you'll see sometime in the next 53 days but today you just get the C, see? A hat-tip to all the Chapin ladies I know -- you're class acts, every single one of you. Day 446 / Hat 446: White, baseball-style cap with black brim, six black embroidered eyelets, black crown button and black and red embroidered "I ♥ NY" logo on front. Interior tag reads: "100% cotton, one size fits all, made in China." Plucked at random from the Bride's headgear archive she purchased this when she was in the city during 9/11. She'd gone there to cover the biannual fashion shows and ended up covering the aftermath of the horrible, horrible attacks on the Word Trade Center for something like a week (it felt like much longer). At first blush it might seem frivolous or cavalier to make such a purchase at such a time but of it the Bride says: "There was this incredible emotional groundswell right afterward and everybody was showing their support in whatever way they could." And, if there's one thing the Bride knows, it's the power of patriotic shopping. Oh, and if you care to make the little ♥ symbol and you're using a keyboard with the big old numeric keypad over on the right, just hold down the ALT key and hit the 3 key on that aforementioned numeric keypad. ♥♥♥♥♥♥ -- Ooohhh it's kinda fun, isn't it? 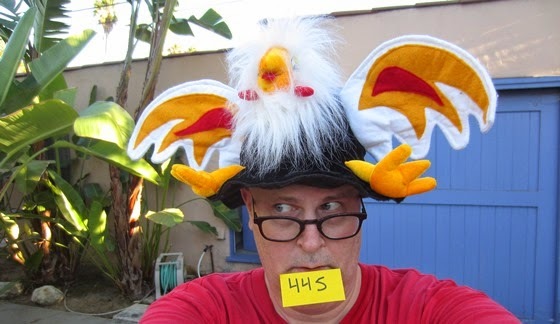 Day 445 / Hat 445: Black velvet bucket hat with two metal grommets and over-the-top chicken details including white felt wings with gold and red felt applique details, two gold, velvet three-toe claws, red, gold and white felt tail feathers, gold velvet beak, red felt tongue, black and white hard plastic eyes and red felt cockscomb nestled in a halo of white head fur. The sixth and final installment of the DSAOH, it's hard to tell what part of this hat makes me laugh more -- the extensive chicken detailing (you're extensive chicken detailing) or the fact that it adorns a black velvet bucket hat. Either way, a sincere vote of thanks to Dianna Scott back in the 802 for trusting me with her menagerie of whimsical millinery. 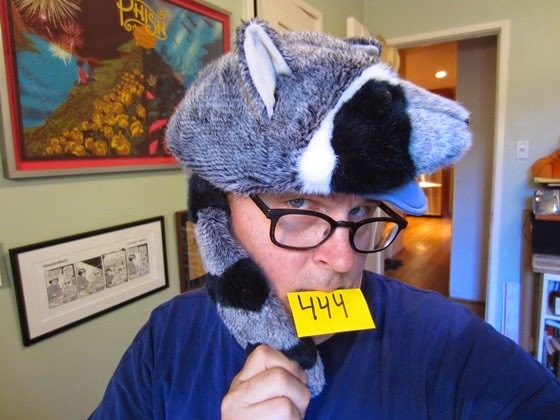 Day 444 / Hat 444: Gray, black and white plush raccoon-shaped cap with hard brown plastic eyes. Additional details include plush two-tone triangular ears and gray-and black-ring-striped tail. Interior six-panel lining is solid gray polyester. Like the previous entries plucked from the DSAOH, this one is devoid of any kind of label or tag. Surprisingly, given how much I detest procyon locor (they're nothing more than rats wearing warpaint and pinstripes in my book) this is not my first raccoon-related lid. There's PC 133 (my childhood coonskin cap) for one and a miniature version of same back at PC 86 for another. But if there's any spokes-raccoon that can rehabilitate the animal's image it's Rocket Raccoon the feisty critter voiced by Bradley Cooper in "Guardians of the Galaxy." Now if I only had a man-shaped tree named Groot as a co-pilot I'd be all set. 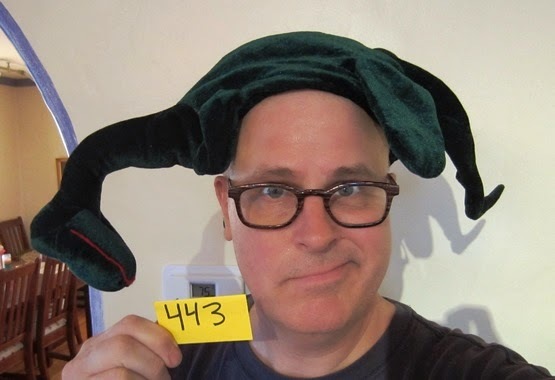 Day 443 / Hat 443: Forest green velvet dinosaur with black and white hard plastic eyes and red felt lips. Installment four from the DSAOH, I grew up knowing this particular dino as the Diplodocus. Based on the above photo, he looks like he's ready to snap into my number Post-It like a bag of Doritos. Rage on Diplodocus, rage on! 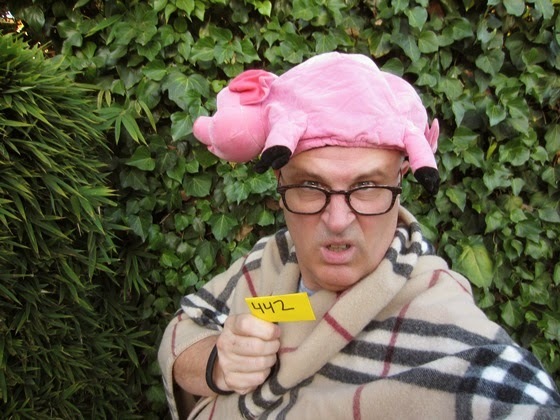 Day 442 / Hat 442: Pink pig hat with hard plastic eyes, black piggy hooves and slightly darker pink ear, snout and mouth detail. Additional snout detail includes two black nostril slits. Interior of hat is black. The third animal-themed hat from the DSAOH, I tried to take today's photo up a notch on the humor scale by accessorizing with a Burberry blanket (Go ahead, you can do it ... Say it out loud ...) to in some cosmic way try to offset the extremely sad news today that one of the funniest men on Earth -- Robin Williams -- has passed away at the age of 63. He brought me and my family -- especially my brother Al -- a great deal of laughter. I especially remember the year I received the 1979 album (they were big old vinyl things back then) "Reality ... What a Concept," which we preceded to play at full blast. When Williams' call and response in the New York echo bit ricocheted off the walls of our tiny upstairs and down the stairs my parents went white-as-a-sheet apoplectic. The hat tip goes to Dianna for entry three, but a very special, heartfelt executive hat-tip to the late, great Robin Williams. We shan't see the likes of ye again any time soon. Day 441 / Hat 441: Plush black and white cow hat. Additional detail includes white horns, black hooves, hard plastic eyes and tiny cowbell at the neck secured by a red string. It should be noted that the cowbell makes a joyful tinkling sound as the wearer walks. This is the sophomore entry from the DSAOH and, based on my deep bench of knowledge on all things bovine I can tell you with a great degree of confidence the black and white markings on this one that it's a Holstein a breed known for its high-volume milk output. Day 440/ Hat 440: Black plush bear hat with front and back paws, brown and black plastic eyes, a black plastic nose pad and a pink plush tongue. 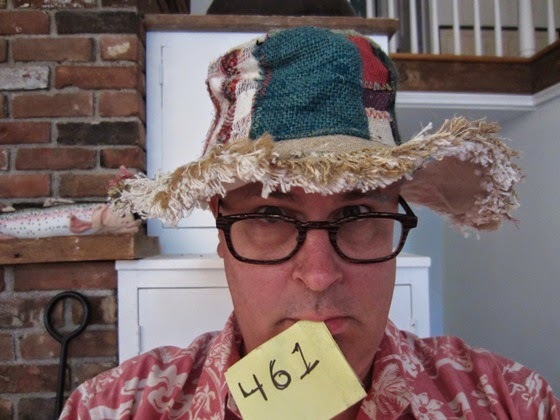 There are no distinguishing labels or tags of any kind on this hat, which arrived in a very exciting box yesterday that I have decided to dub the DSAOH -- the Dianna Scott Ark of Hats. I know family friend DS is a teacher back in the 802 and she explained that she ran across the menagerie of millinery while packing up her classroom and offered to send 'em for use in the Project if I promised to return them. She did -- and I shall. I chose this particular one for this particular day in honor of my ursine idol Smokey Bear who is celebrating his 70th birthday this very day. That's also why I chose to snap today's installment in the recently remodeled Garlodge with the recently stripped-down Press Pass Bear. Even PPB got in the mood today by donning my Vivienne Westwood Mountain hat (which I wore for PC 271) and sporting the "Friends of Smokey Bear" patch I recently ordered. These three bears (or maybe I make four) wish Smokey a very happy birthday -- and extend a heartfelt hat-tip to Dianna Scott for this first of many loaners to be featured! Day 439 / Hat 439: Gray, flat-topped cap with short bill. Interior tag reads: "Yellow 108, 56% hemp, 44% recycled polyester, made in China." Hang tag reads: "Yellow 108 is based in sunny Los Angeles, California. We specialize in creating access made from recycled, salvaged and sustainable materials.Designed to make you smile :)" (emphasis original). Yes, in a moment of weakness I stealth-snapped at the local Whole Foods on the way to work. You might say I went for a salad and left with a hat. But in my defense it is a super cute lid, no? The road to 500 is a rocky one and sometimes these measures must be taken. Day 438 / Hat 438: Orange, puffy, basketball-shaped helmet with "6th Man" embroidered on back in purple and the Los Angeles Lakers logo in purple and gold on front (I'm wearing this backward, obvi.) Interior label reads: "Team Heads" on one side and "surface wash only, , all new material , made in Indonesia, ages 3 years and up (materials consist of polyester fiber)." Hard to believe that this Lakers-related lid -- from my own hat stash - hasn't been featured in the Project yet. I'be had plenty of Lakers headgear and even a different basketball-shaped helmet (back at PC 223 -- who knew these were a thing) but damned if this one somehow escaped my grasp. I would've saved it for the start of the season but Seuss willing I'll have this game in the refrigerator( as Chick Hearn used to say) long before the first ball drops on the 2014-2015 season. 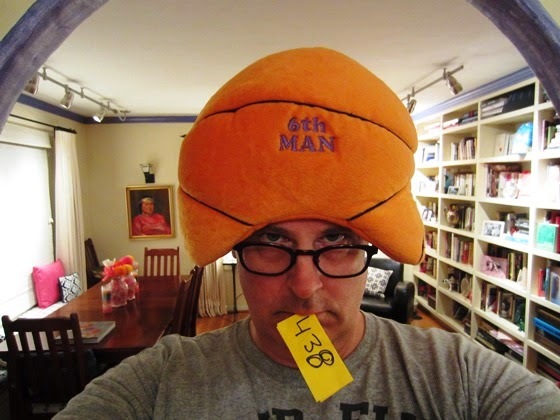 I tip my bulbous orange hat to all sixth men wherever they may be tonight. You know who you are anfd you know what you do. Day 437 / Hat 437: Faux fur tiger-stripe spirit hood with a pair of paddy paws that hand down though I'm wearing them wrapped around my neck like a scarf in the above photo. Interior label reads "SpiritHoods, made in Los Angeles, 2011-2012," and interior fabrication tag reads: "RN 107556, fur: 100% acrylic, liner 55% linen, 45% rayon, machine wash cold, hang to dry or dry clean, made in USA." The photo kind of makes me laugh for two reasons. First I took the photo outside with the sun full overhead so there's some light bouncing off the driveway that's giving me a real golden glow. Second, I realize I'm wearing my "One-Man Wolf Pack" T-shirt which is kind of mixing critters, no? 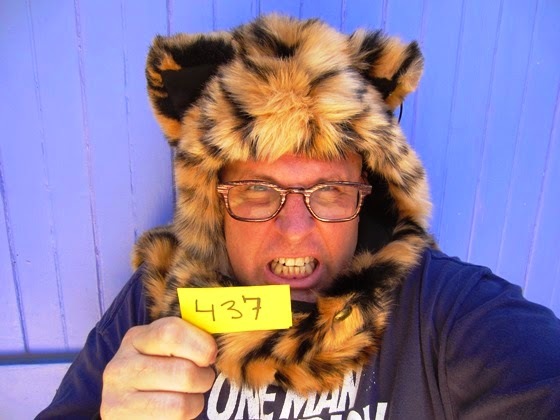 Or maybe, just today, based on my cursory knowledge of collective nouns, I'm what you might call either a "one-man tiger ambush" or a "one-man tiger streak."